The 2017 Three Rivers Educational Technology Conference (TRETC) took place on November 6-7 at the Montour School District. I had a chance to be a featured speaker and share some of my work on “Redesigning Learning Spaces” in the new K-4 Montour Elementary School with the help of Justin Aglio, Director of K-4 Academic Achievement and K-12 Innovation, and Dr. Christopher Stone, Superintendent of the Montour School District. I continue to coordinate a series of Design Challenges for the Energy Innovation Center (EIC). The program includes high school students from the Parkway West consortium of schools. This fall the challenges focus on redesigning Innovation Hall at the EIC and developing new food menu items for the EIC Healthy Cafe due to open in Spring 2018. One of the challenges from last spring will come to fruition this fall with the construction of a WindStax windmill at the EIC. 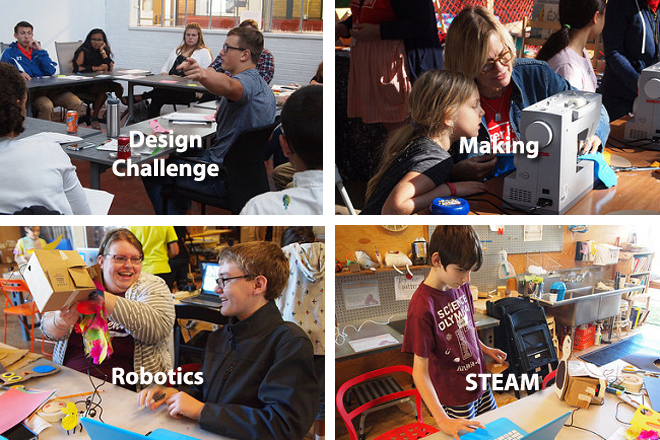 In October Birdbrain Technologies held a Makeathon at the Children’s Museum as part of this year’s Maker Faire. It was exciting to see learners, young and older, students and parents, working on their Robot for the Petting Zoo in the Children’s Museum. The 2017 K-12 Horizon Report used three of my photographs for their front and back covers. For the Consortium of Schools Networked (CoSN) I’m helping to develop an outline for the Edtech Next report on “Artificial Intelligence in K-12 Learning.” In March I’ll present the findings for the report at the annual CoSN Conference in Washington D.C. This fall I started to work with the Manchester Academic Charter School (MACS) on a consulting basis after serving six years on the Board of Directors. MACS will move its middle school into what the Children’s Museum is calling “Museum Lab,” a research project where I hope to get students and teachers involved with learning scientists from Carnegie Mellon University and the University of Pittsburgh investigating how we can take the learning that occurs in informal spaces into the K-12 classroom.